It's traditional to give flowers to veterans on May 9th &, as you can see, they get lots of them. I sometimes wonder how they carry them home. Many do come to the festivities with their children, grandchildren & great-grandchildren to help with the flowers or assist those who are infirm. The small accordion he's holding was with him throughout the war. It's been repaired numerous times, but still plays. Seems yesterday was another red letter day in the Dailies. See my starter comment below. Have a good one! This is really a wonderful shot Susan! Wow.. I love it! 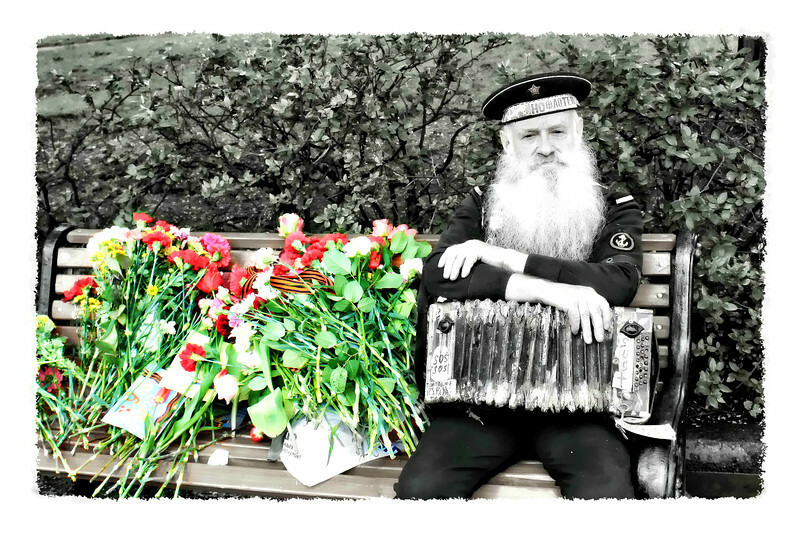 Your clever processing with desaturation of the background, color selection of the flowers and the Old Sailor in black and white really adds great interest to the image. Fascinating to look at.wonderful details and textures throughout.. Regarding your initial post in reference to the thumbs up or down it looks like that is finally a fixed situation... I hope this will keep problems away from the dailies..this is such a great community and whether I am here daily or skip some weeks I always feel welcomed back and part of the group.. I want it to stay that way! This is great! I love your use of SC here. As far as the thumbs, I am confused. I haven't been here in about 2 weeks, but my understanding at that time was that the thumbs had been removed due to the red thumbing. I do not see or have any thumbs (red or green) when I look at the Daily Photos community photos, and there aren't any on my galleries that are connected to the Daily community. There ARE, though, other negative effects of that change, which sm said when I contacted them, was due to the change. This would be that I no longer can have my galleries connected to the dailies customized with my own banner, which makes them nearly impossible for people to navigate. As far as I can see, there are no thumbs available to click on. So I'm confused as to how someone red-thumbed? Wonderful image, I love everything about this, his expression and accordion. The sc is the perfect touch. It's fantastic that they honor the veterans in this way. These photographs have been so interesting... thanks so much for sharing. Outstanding shot; love the sc! It is wonderful that veterans of the war are so revered here! Love that they get flowers! I'm loving that the red thumber can't crush this photo today! Great shot and nice sc"
I wanted to post one more comment on this beautiful shot Susan. It is magnificent - one of the best. I like everything about it. The SC, the man's expression, the accordian - it's just all wonderful! Hang in there.